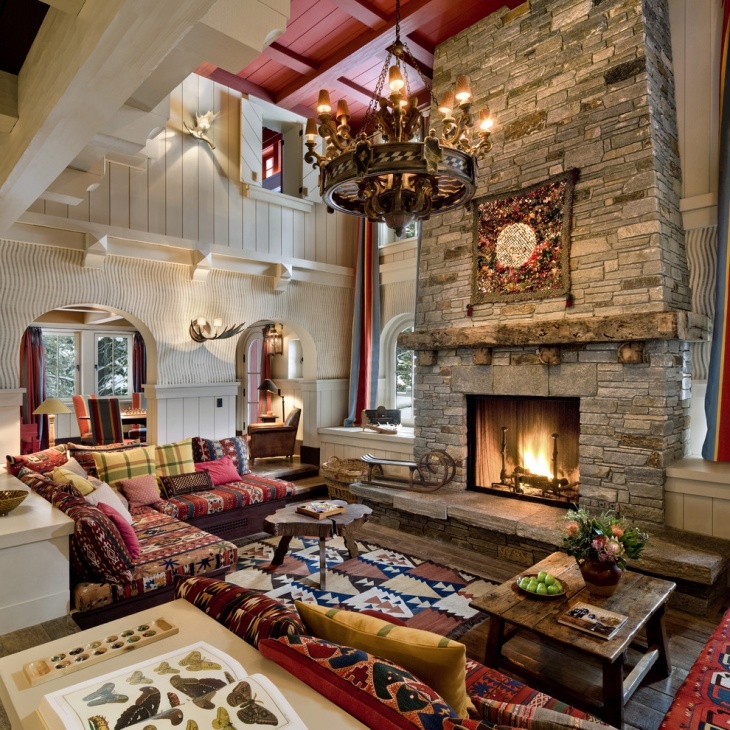 This rustic chalet living room has a very romantic ambiance where the walls are made out of carved stone woods and below is a fireplace to warm up. The furniture and décor also hold a traditional touch to it including the chandelier light, sofas, coffee table, rugs etc. 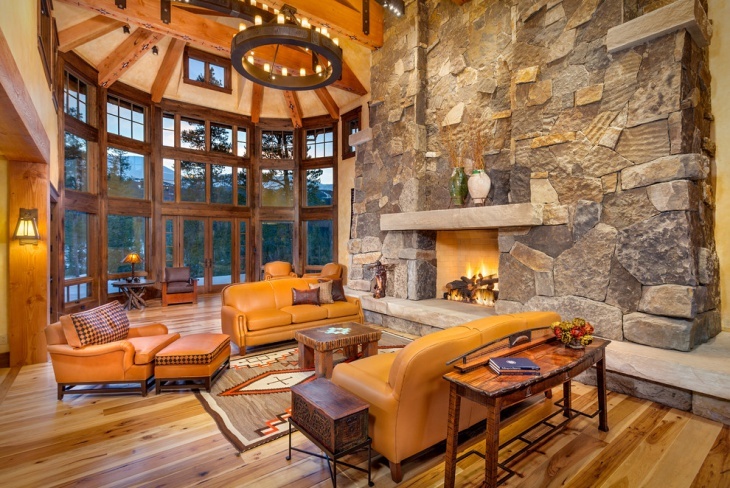 This beautiful rustic theme chalet living room has made use of earthy warm color tones such as beige, brown and gold. It features a large animal faced statue, a stone carved wall with fireplace, a round wooden coffee table, a large set of golden sofas and lights. This is a lavish living room featuring luxurious furniture and has a contemporary style built. 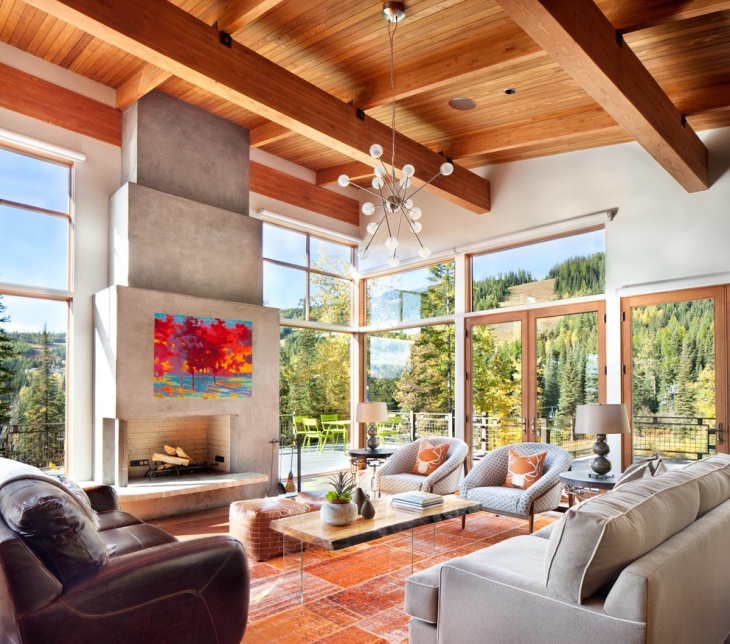 Featuring a hardwood flooring in chocolate brown, stone carved pillar walls in the two corners and contemporary wall organizers, this beautiful living room calls for an ultra modern chalet design. 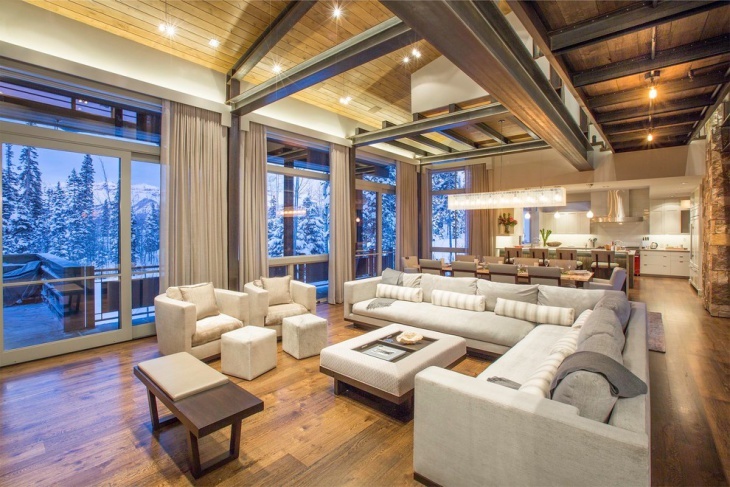 This contemporary living room is very large and spacious with a chalet design. It features a pitched ceiling having western interiors. The colors used for décor are mostly wooden and rustic. The ceiling is made of hardwood and has focus light setting. Apart from that, there are comfortable leather sofas in gray that complement the theme of this living room design. Design by Scott Gilbride/Architect Inc. 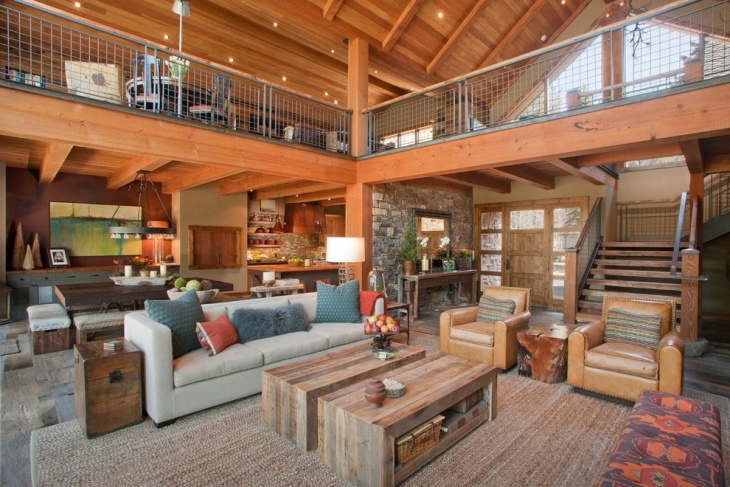 This is yet another beautiful living room with a rustic style but having an open concept design. The room is very large with the furniture and décor altogether placed in one. It has a wooden ceiling with small ceiling lights affixed to them. 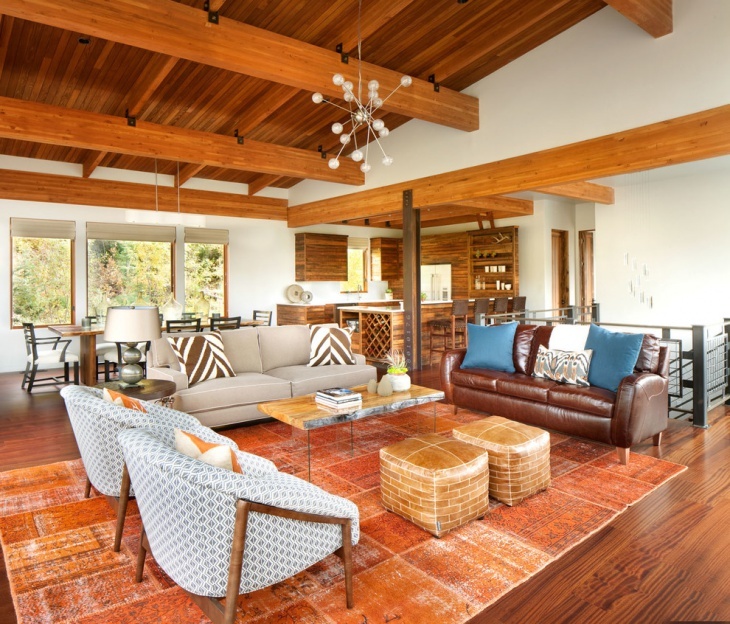 The coffee table is also made of wood and to match that is the rug placed in the center that is in color beige. 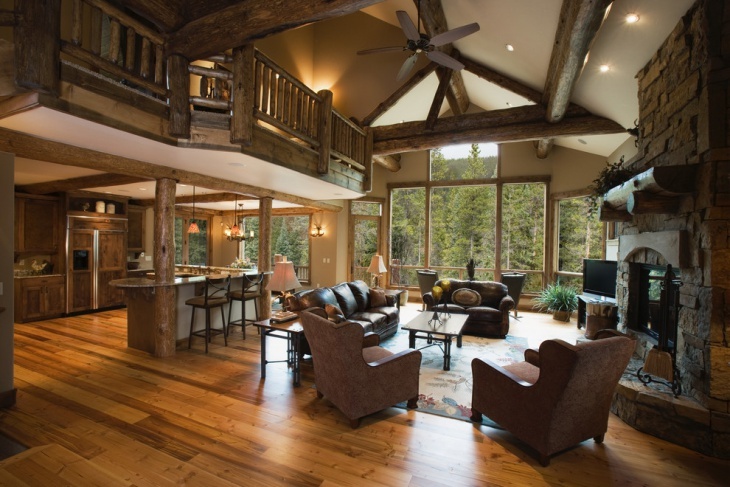 This chalet living room is inspired by the creek style and has chocolate brown colored interiors used ranging from the sofas to the fans and the stone carved ceilings and borders. It is the main living room with a divider for the kitchen. 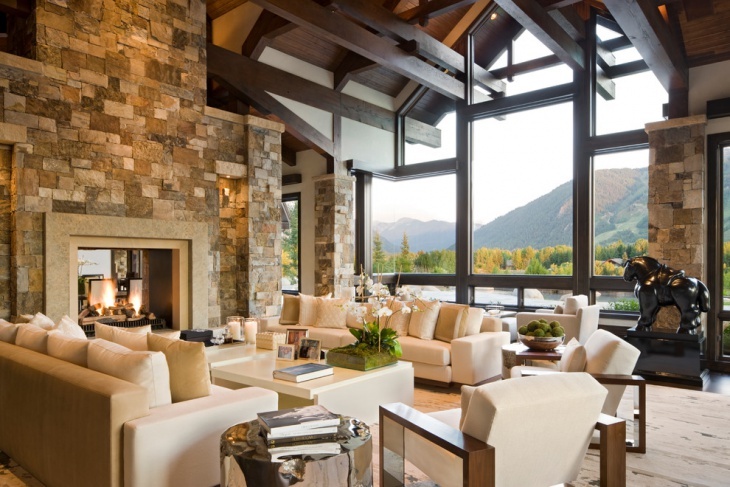 All the interiors are made out of natural stone that is perfect for a chalet living room design. 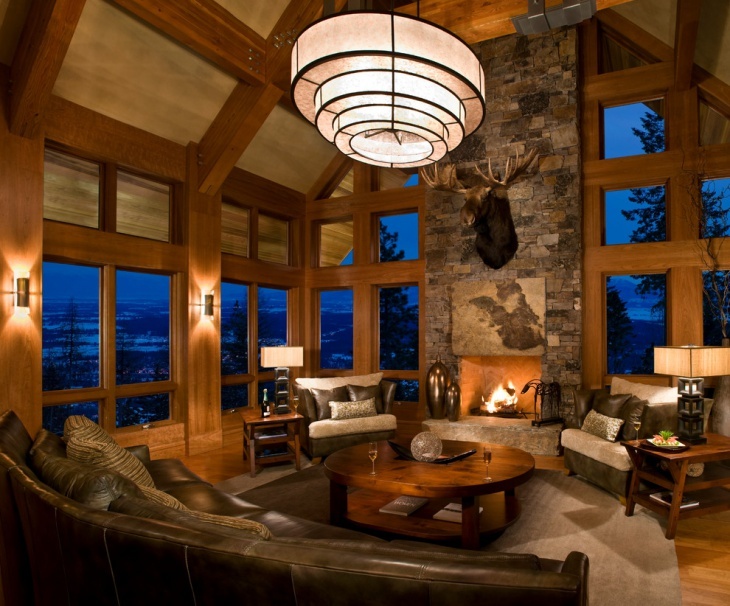 This beautiful and traditional chalet-style living room design is exceptional. 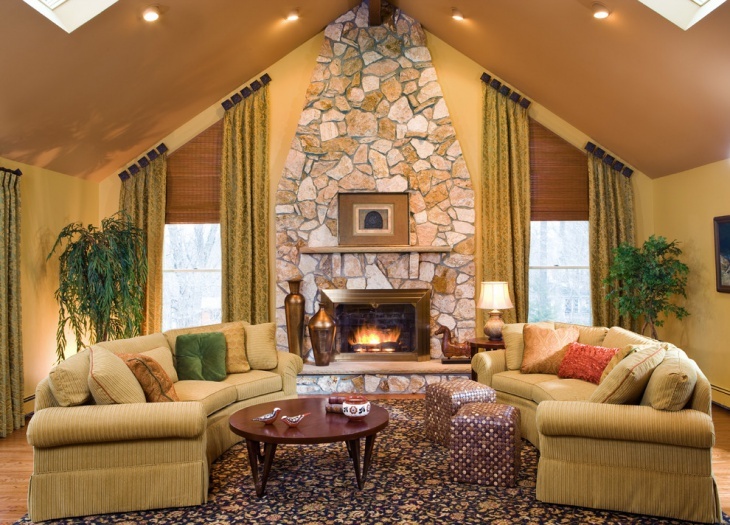 Consisting of a stone fireplace, with wooden ceilings in the cottage style and all traditional décor, it calls for an ideal chalet-style living room design and can be incorporated in farmhouses and the like. 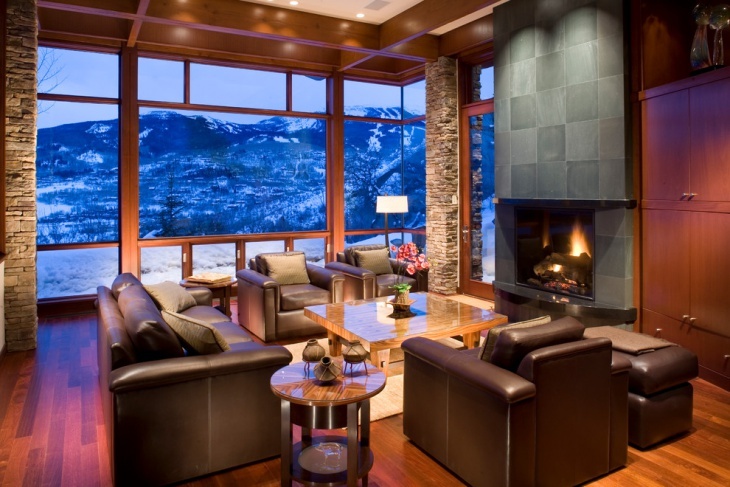 This rustic living room idea with European ski chalets has a stone carved wall with fireplace for a good warm up session. To match the décor are all the accessories and furniture used ranging from the sofa sets to the rug and the lighting. 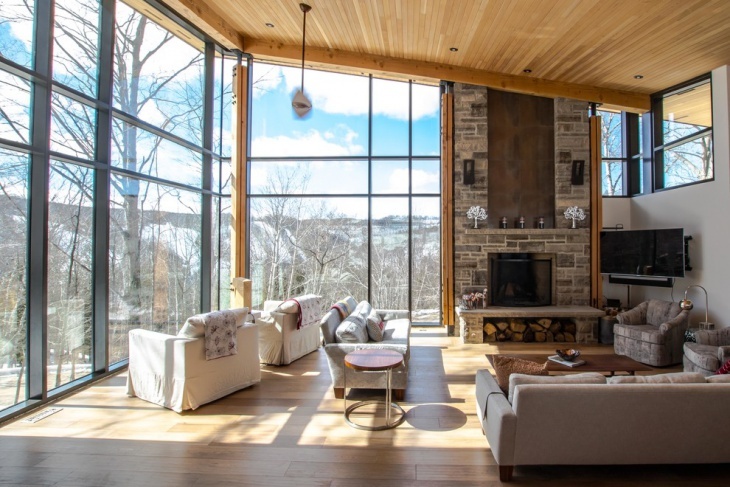 This amazing chalet living room is of a contemporary style having a stone-carved wall on one side with the fireplace and a tan roof with detailed border ceilings. It features a number of comfortable sofas in white and another antique décor. 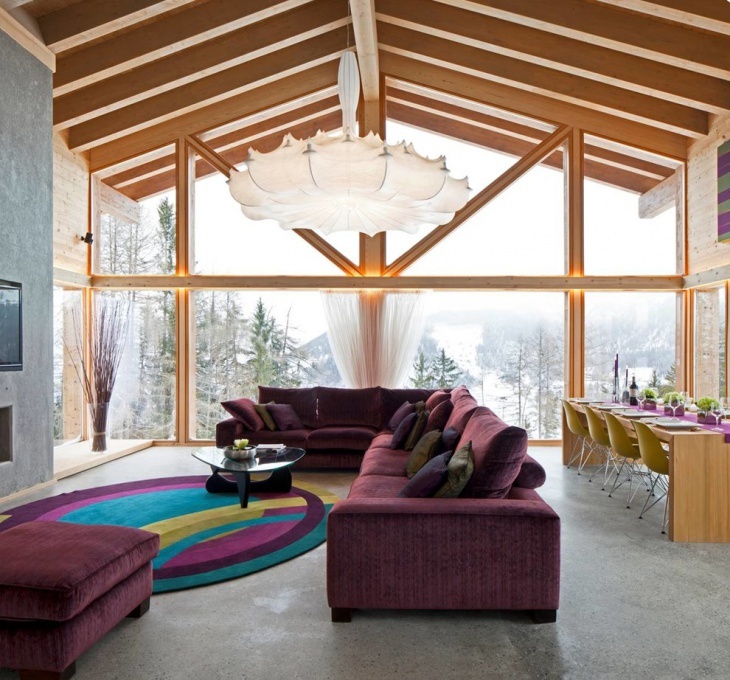 Chalet living room designs are beautiful, unique and one of a kind. They remind us of the memories and bring about old vibes. 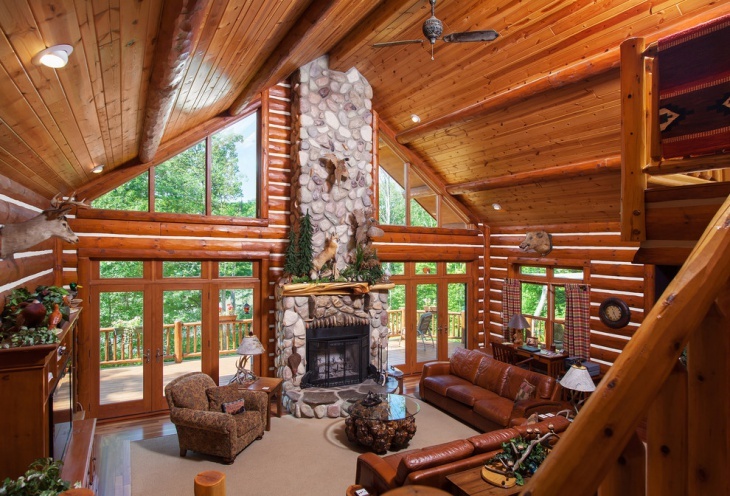 Draw inspiration from the above chalet living room designs and incorporate one in your own house.